Send the status(es) defined for the Post Type under the Bulk Publish action. Bulk Publish statuses are best for reviving (reposting) old Posts on a one time basis, that you’re not likely to update the content of very often. Want to automatically send status updates to Buffer for old Posts that you’re unlikely to update? Use the Repost Settings options. 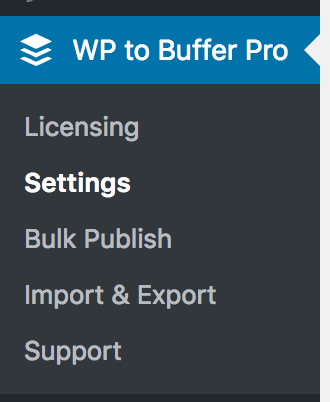 In the WordPress Administration, click on the WP to Buffer Pro > Settings in the menu. Define your default status settings, and optionally define per-profile settings, under the Bulk Publish action. Refer to the Status Settings Documentation. You will then be taken to WordPress to Buffer Pro’s Bulk Publish screen, where you can confirm the Post(s) you have selected. This is documented below. 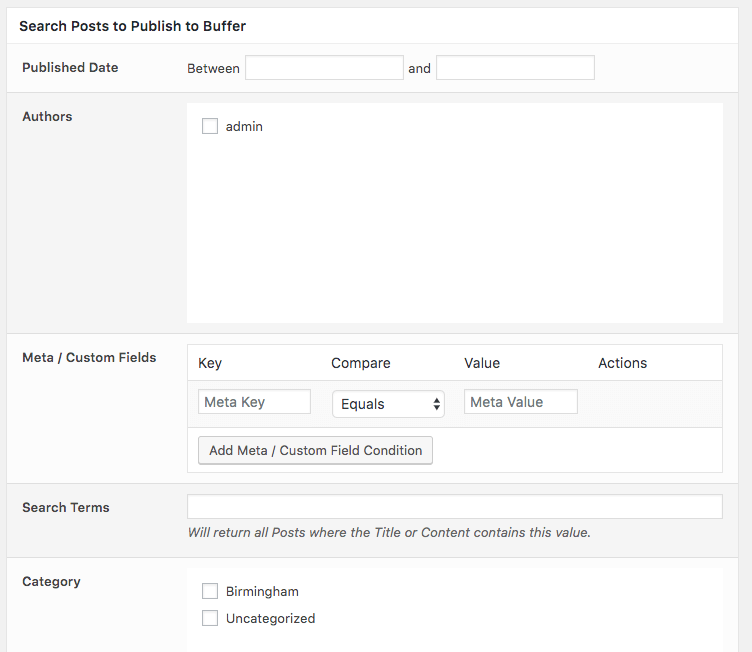 Next, we’ll query our Post Type to get a subset of Posts that we can then choose to publish to Buffer. 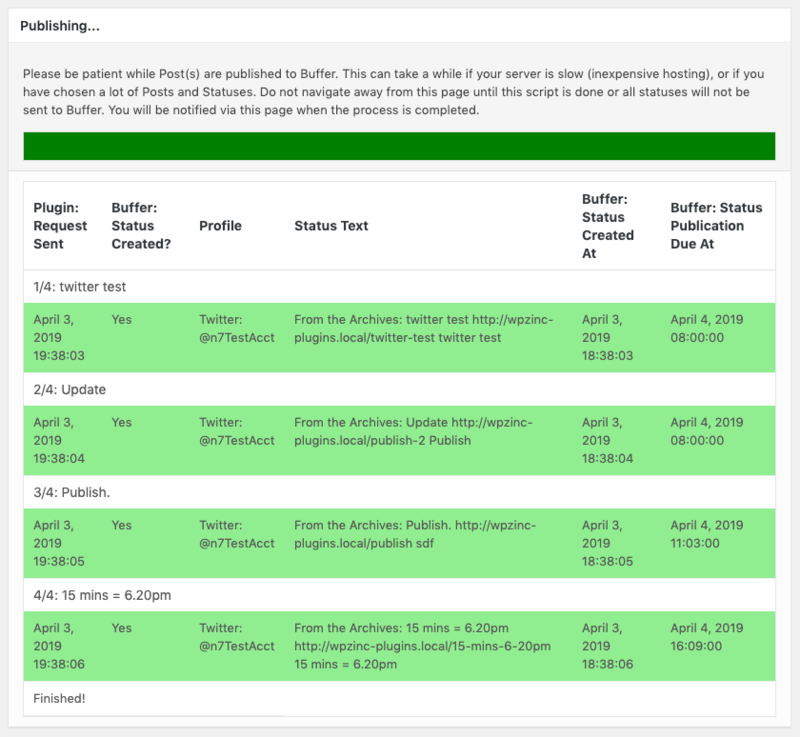 Several filters are available, which allow you to determine the Post(s) that you want to select for Bulk Publishing to Buffer. Published Date: Click on the date fields, and use the datepicker to choose the start and end publication dates. You must specify start and end dates. Author: To only publish Posts to Buffer written by specific Author(s), select them by clicking the checkbox beside their username. Multiple Meta / Custom Field key/values can be added, if you want to restrict Posts by multiple values. Search Terms: Posts will only be published to Buffer if their Title or Content contain the given search term(s). If you’re looking to restrict Posts by Page Builder or Advanced Custom Fields data, you’ll need to use the Meta / Custom Fields option above with the ‘LIKE’ comparison. Most Page Builders / ACF data is stored in Post Meta, meaning the Search Terms options here will not apply. Taxonomy Terms: Depending on your Post Type, you’ll see options to select Terms for e.g. Categories, Tags. Posts will only be included for publication if they match any of the chosen term(s). 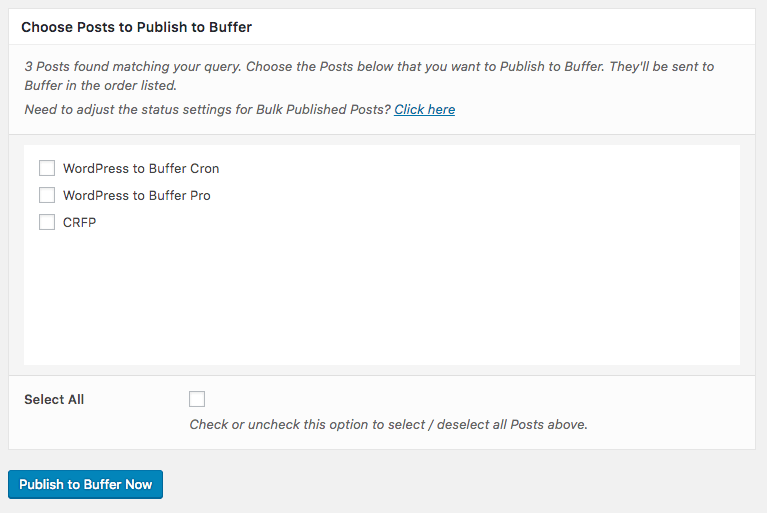 Order By: Defines how to order Posts that will be added to your Buffer queue. Order: Defines the order in which Posts will be processed and added to your Buffer queue. This is used in combination with the Order By setting – for example, you can choose to send Posts to Buffer starting with the oldest published date first. Either use the Select All option to choose to publish all Posts to Buffer, or use the checkboxes beside the Post(s) you want to publish to Buffer. Click Publish to Buffer Now to publish the selected Post(s) to Buffer. 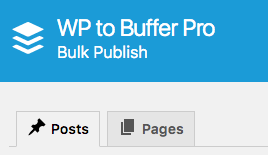 WordPress to Buffer Pro will display on screen progress whilst it publishes each of your Post(s) to Buffer. Make sure you don’t close your browser window / tab until this process is complete. For each Post and status, you’ll see an on screen message confirming whether publication succeeded or not.